In many ways, Justin Trudeau's victory on Oct. 19 was an urban one, with the Liberals virtually sweeping the urban ridings and winning just enough rural ones to put them over the top for a majority government. The Elections Canada results page, in addition to showing the breakdown of the results by province, also has the option to show the results in major centres. I'm not quite sure how those are defined (likely any riding within a CMA), and these results are the preliminary results, but they do give us an indication of how each of these major centres voted in the federal election. UPDATE: The definitions for each major centre can be found here. As you can see, Elections Canada used a wide brush to define these. In the chart below, I've included all of the major centres that Election Canada defined as having at least three ridings. None of this information is original — but considering the way that Elections Canada has the data organized (you can only see four at a time) I thought it would be useful to compile it all in one place. The Liberals won big in each of the largest three cities, beating out the Conservatives by 14 points in and around Vancouver and 16 points in and around Toronto, while also edging out the New Democrats by 15 points in and around Montreal. But the Liberals also did very well in other big centres, topping 40% in Winnipeg, Hamilton, Kingston, Kitchener-Waterloo, Ottawa, Gatineau, Halifax, Moncton, and St. John's. They also managed to eke out victories in Sherbrooke and Trois-Rivières, the last two some real signals of how the Liberals broke through in francophone Quebec. Outside of Atlantic Canada, the Ottawa-Gatineau region was the major centre that voted in the largest numbers for the Liberals. The party also did quite well in the southern Ontario cities like London, Oshawa, and St. Catharines-Niagara, centres they lost to the Conservatives by narrow margins. Surprisingly, the Liberals placed second in Quebec City and Regina. 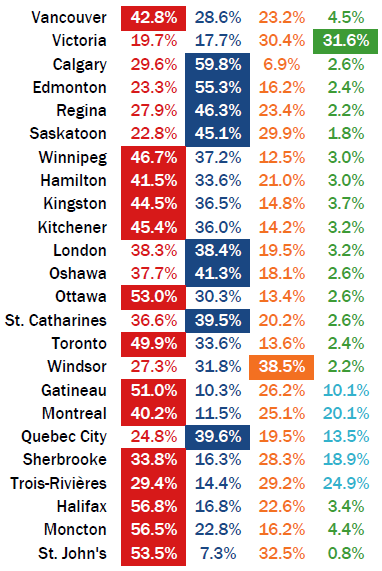 Only in Victoria, Saskatoon, and Windsor did the Liberals finish in third place. And it is something to see the party sitting at just under 30% in Calgary. The Conservatives won the cities in Alberta and Saskatchewan by very wide margins, and managed to squeeze out the Liberals in London, Oshawa, and St. Catharines-Niagara. The party did very well in Quebec City, winning it by 15 points. The Tories also had strong second-place showings in Winnipeg, Kingston, and Kitchener-Waterloo. Its numbers in Montreal and Gatineau were unsurprisingly low, but the party also put up poor numbers in Atlantic Canada and in both Vancouver and Victoria, though their Vancouver numbers were enough to place them second. And that is because the New Democrats were pushed out of the urban centres in big ways. The only city they won was Windsor, with just under 39 per cent, and in only St. John's and Victoria (which the NDP narrowly lost to the Greens) did the party manage more than 30% support. In addition to those two cities, the NDP also finished second in Saskatoon, Gatineau, Montreal, Sherbrooke, Trois-Rivières, and Halifax. The Bloc had poor numbers in the five major centres in Quebec, putting up their best results in Trois-Rivières and Montreal, where they took over 20% support. The Greens won Victoria by the skin of their teeth (and thanks to Elizabeth May), but nowhere else did better than 4.5% support. "The Greens won Victoria by the skin of their teeth (and thanks to Elizabeth May"
This must be a mistake as the NDP won Victoria by a wide margin - perhaps early returns and not the final result. The NDP won the riding of Victoria, but Elections Canada is considering here all the ridings within the wider metropolitan area - which would include May's riding of Saanich Gulf Islands. Definitions of the Major Centres are available at http://www.elections.ca/enr/help/help_centre_e.htm. Mississauga should be on this list as it has a larger population than 1/3 the cities above. One thing to keep in mind is that the overall Regina results are skewed in favour of the Conservatives by the one remaining rurban riding of Regina-Qu'Appelle. As we know, rural Saskatchewan overwhelmingly votes for the Conservatives. The other ridings were either a close race (NDP edging Cons in Regina-Lewvan, though the Libs got a decent result there too; or Ralph Goodale annihilating everyone else in Regina-Wascana). I knew the NDP had what I term; an "English Canada problem", I had no idea it extended into an "urban Canada problem. 13% in Toronto and Ottawa! 18% in Oshawa, Ed Broiadbent's home town. 22.6% in Halifax in what was and should be the NDP's stronghold in Nova Scotia and Atlantic Canada is poor. at 22% in Halifax It certainly appears as if the NS NDP will do well to return as Official Opposition in 2017 but, at this rate soldifying their third party status is more likely. There is some residual strength in the urban areas of Quebec but, considering the volatility of the Quebec electorate over the last 25 years, one wonders if this is a base or simply a remnant of Le Bon Jack that will further dissipate over time. The NDP did not meet expectations in the most recent election but, at 44 seats, still had the second-best result in its history. Jack Layton's first three campaigns resulted in 19 seats, 29 seats and 37 seats. Replacing a leader is only advisable if the replacement can do better (as the Bloc found out the hard way 2011-2015). Also, what volatility has the Quebec electorate had over the past 25 years? Quebec handed the Bloc Quebecois 6 majority victories in a row from 1993-2008. That is one way to look at it but, I think most people view Mulcair as the leader who took a party leading in the polls to third place in the span of 78 days. It is a cruel reality that sometimes even the best Opposition leaders make feeble campaigners and vice versa. At this juncture I think most Canadians have written off Mulcair as a future prime minister, it is obvious Mulcair's legendary stubbornness is making him cling to the leadership but, his day has passed. Another time, another place, he probably could be prime minister. Some Opposition leaders deserve a second chance and Dippers will decide in the New Year whether Mulcair is so lucky. To my mind it's obvious he has to go. Adrian Dix did better than Mulcair-he became Leader of the Official Opposition but, wisely stepped down. A leadership race will showcase a younger generation of talent, something that is desperately needed after the loss of Megan Leslie, Paul Dewar, Peggy Nash, Nycole Turmel. Capilano: post-campaign perceptions are not great indicators of future success. Had Stephen Harper's squandered lead in the 2004 election campaign been an indicator, he would not have been around for 2006. Dalton McGuinty, Jean Charest and Gordon Campbell all lost their first campaigns but survived to be multiple winners. Most party leaders have to have a historically poor result and/or lose their own seat (Kim Campbell, Audrey McLaughlin, Michael Ignatieff) and/or active, well-organized internal opponents (Stockwell Day, Stephane Dion) to lose the leadership after one campaign. Even then, some survive: John Turner had a disastrous result in 1984 and had Jean Chretien constantly undermining him, yet survived to fight another campaign; Elizabeth May has had a string of results of 0-1 seat (no better than her virtually unknown predecessor) yet remains Green leader. Considering that the NDP's result in 2015 was disappointing rather than disastrous, and that no potential alternative leader is particularly well-known, organized, or ready to stage a coup, I can't see Mulcair leaving before 2019 at the earliest. I take your point but, I am sure we can find just as many leaders who stepped down after poor performances. Audrey MacLaughlin won her seat but, stepped down as leader in 1993 and Mulcair should follow her example. Broadbent brought the NDP to its then best ever performance in 1988 but, realised he had brought the party as far as he could, Mulcair should do the same. This last campaign was a disaster for the NDP! Worse than a disaster, it demonstrates that even when the odds are in their favour they can't capture government! This means the NDP is essentially unelectable and of debatable usefulness. They're like the Green Party: nice to have around to remind voters of an important issue but, not a competitor for power. The 2015 election was a catastrophe for the NDP since, it transformed the party from a competitor into an also ran and ruined the Party's best chance in 82 years to form Government. Another chance as good is not likely to roll along in Mulcair's lifetime. It is not about what happened in the past though, it is about the future and the future is clearly heading toward the next generation of leadership emerging from both the Liberal and Conservative parties. Against a Lisa Raitt and J.T., Mulcair doesn't look very progressive, attractive or interesting. For a leader with charisma this wouldn't be a problem but, Mulcair is known for his hard hitting bellicose questioning not his charismatic man-of-the-people glad-handing. The NDP's next generation of leadership was mostly wiped out on Oct. 19th along with most of their front bench. A leadership race is one way to attract new members and replenish a diminished party and leadership apparatus. More importantly it is a way for the party to re-introduce its new members and front bench and gain some much needed publicity. Both Mulcair and Layton campaigned on the NDP being a "major Party". Mulcair proved how illusionary that claim was. He did not hold the Ontario or Quebec or Maritime base of the party-it was a disastrous result! Mulcair has put the party back to 1980 both in terms of seats and attractiveness. Mulcair at the end of the day failed in his most important task; He was elected leader to hold together the Quebec wing of the party. The Quebec wing left en masse to other parties in the 2015 election-he failed and he should take responsibility. I can't see Mulcair leaving either. His stubbornness is well known. That he would put himself ahead of the Party is not surprising. That the party would allow its best interest to be subsumed by the personal interests of the leader is shocking! Comment: only 1 seat by Greens, so doesn't say much. One thing that strikes me is how low the level of Conservative support was in Vancouver and Victoria. In both cities, it was lower than any other city outside Quebec or Atlantic Canada. I know that Conservative support was 5% lower in BC compared with Ontario, but I didn't realize it was also 5% lower in Vancouver compared with Toronto. Vancouver has been a Liberal City almost from its founding, the safest Liberal seat in the country is in Vancouver; Vancouver-Quadra. Victoria used to have some strong Tory roots but, immigration and the unionisation of the civil service has reduced its influence. I'm not just talking about the 6 City of Vancouver ridings, where the Liberals have always done better than the Conservatives. I'm talking about the 17 suburban ridings around Vancouver where the Conservatives went from 48% in 2011 to 31% in 2015 - a 17% drop. By comparison, the Conservative drop in the 28 suburban ridings around Toronto was much smaller - from 49% in 2011 to 40% in 2015. I understand why this may seem unusual but, in BC those suburban ridings also swing between the BC Liberals and the NDP. So while the drop may be larger than the national average it generally follows long held voting patterns in BC. @Capilano Dunbar - Remember that the Liberals barely held onto Vancouver Quadra in the 2011 election. I think Vancouver Centre is safer. Well Ira, then you would be wrong. I remember very well Ira as I live in Quadra and have done so for the better part of three decades. Elections are consistently closer in Centre than Quadra. As an example. Murray only won by 3.5% in 2011 whereas Hedy Fry captured Cnetre with close to a 5% lead However, in terms of votes Murray had a lead of 3295 votes compared with 2935 for Fry. More importantly the Liberals or any party rarely reach the 40% mark in Centre whereas, since 1984, the Liberals with the exception of a by-election, have only fallen below 40% in 1993. I lived in Quadra and/or Centre (as the boundary between Quadra and Centre moved across me, or I moved across it) from 2001-2014. Hedy Fry seemed like such an institution. But perhaps it's more her riding than a Liberal riding. The LGBTQ community love Hedy and she continually gains the nomination out of respect for defeating Kim Campbell and the knowledge that her ground team can get the vote out. Without Hedy, the riding is a three maybe even a four party race. If we look at the results in the three Saskatoon ridings, it shows that these numbers are probably quiet off as they overestimate the Conservatives greatly, and underestimate the Liberals slightly, and the NDP significantly. The only way that I can see how these numbers where formed was with the inclusion of Carlton-Trail-Eagle Creek. Either way interesting to see, thanks! Wow, this makes London, Ontario look really really strange. They are the only city with multiple ridings, outside the Conservative stronghold of Quebec city, Alberta & Sask., that voted conservative. What's going on there? I know rural western Ontario is really conservative, and kinda scary that way, but what's going on in London? Is there that many "old stock" Rob Ford fans we don't know about? Kingston has a huge amount of "old stock" voters, but most of those neighborhoods went solidly Liberal. Having spent some time in London, it seems much more open than conservative-reserved-buttoned up Kingston. Or is that just because it's a bigger city? Any ideas? Something's wrong here. London didn't elect any conservatives. We elected two Liberals and one NDP. I will add this link to the post. I'd be curious to see this data with the word "city" more accurately defined. Of the 5 ridings that Elections Canada says make up London, only 3 of them are actually within the city limits. I think these are not cities but metropolitan areas (Which is why Mississauga and Brampton are grouped in with Toronto for instance). Best offical thing I could find suggestion cities that are included in the London metropolitan area. I agree with Matt and Brad. The stats for London are not right, and anything that includes rural ridings should not be included in the city results. The area around London is full of far right wing, wing nuts as shown by election results. It's almost a different province than the rest of Ontario, the right wing fervor is so strong over there right now. And what about Ontario, those poor fellows are stuck with anyone dumb enough to live in Toronto-talk about insane! I would only maybe say, Éric, that your analysis above with respect to London perhaps implies much more Con support within the actual urban part of "London". That support comes from non-urban parts of the area, which actually bolsters your point about the Libs in urban Canada as a whole. St. Catharines was won by the Liberals' Chris Bittle. These are major centres, including outlying areas. And St. Catharines here is St. Catharines-Niagara. St. Catharines went Liberal, as did Niagara Centre (Welland). Niagara Falls stayed Conservative with Rob Nicholson. Niagara West, which is rural, went Conservative. Any idea how Elections Canada decided on the definition of major centres? Some of their definitions are absurd. "Edmonton" including both Yellowhead and Battle River - Crowfoot? That definitions of Edmonton literally reaches the borders of both BC and Saskatchewan. You can drive 841 km from Grande Cache to Sibbald and never leave "Edmonton" by this definition. Sibbald is 120km closer to Saskatoon than it is to Edmonton, while Grande Cache is closer to Fort St John in northern BC that it is to Edmonton. Éric, do you plan to repeat this analysis in the future, but with a more appropriate definition for each major centre? Keep up the great work! Including Yellowhead doesn't make a lot of sense. Battle River--Crowfoot is even more absurd. Forget Saskatoon; the southern reaches of the riding are closer to Regina than to Edmonton. I wouldn't even let Edmonton have Lakeland. The definition of Calgary needs to include some truly rural ridings to capture the metropolitan population, but Edmonton already has those ridings (Sturgeon River--Parkland, Sherwood Park--Fort Saskatchewan, Edmonton--Wetaskiwin). Yellowhead now includes the far West suburbs of Dedmonton. If one includes Edson, for example, as a suburb. Yellowhead goes as far East as Onoway which if I recall correctly is about an hour from Edmonton in light traffic. There is no reasonable definition of a "suburb" that includes Edson as a suburb of Edmonton. It's 200 km west of Edmonton, separated almost entirely by farmland with patches of forest. By this definition we could include Ottawa as a suburb of Montreal, or Buffalo as a suburb of Toronto. By counting Yellowhead as Edmonton, you're basically saying that you cannot define Edmonton without including the tiny towns of Thorsby and Carvel, and to do so you're willing to take Hinton and Rocky Mountain House and Caroline and Jasper to do it. Right you are Ira. It is Ridiculous. I believe I have found the reason Yellowhead is included in "Edmonton". Yellowhead includes much of Leduc, home of the YEG airport. While I would not include Leduc as a suburb in the traditional sense, it is in the range of the "commuter belt". Rather silly as the Southern portion of the riding is closer to Calgary than Dedmonton. Actually, Leduc and YEG airport are both in the riding of Edmonton-Wetaskiwin. I think the definition should be in anymore than the % of rural voters is anywhere around 30%, the it shouldn't be considered an urban riding because it skewers the results too much. I agree with Matt up top. The way the site has done it, really messes up the London stats. Well how or why Elections Canada decided to separate the county town (LeDuc) from the county is beyond me. I formerly thought Elections Canada did a good job but, I am not so sure today. They're trying to get roughly the same population in each riding. Unless they start becoming really strange shapes, sometimes the borders are going to be in weird places. It seems like if any part of any riding is in the "greater metropolitan riding," then it counts for the purposes of Elections Canada's "urban" definition. As Fred G mentioned, this is what caused the London issue in the table above. I don't know Edmonton, but having voters 800km apart does seem excessively large to be counted in the same urban area! Looks like Elections Canada needs a shot from The Affordable Care Act (Obamacare). Any chance of a chart from the 2011 election to see the shift in voting patterns? Any historical context would be nice. Any comparison to past elections?